The easiest way to turn your digital agency into an email marketing service overnight! With EasySendy Pro you can easily create and send your email campaigns, through multiple cloud SMTP Relay Service Providers and Aritic Mail dedicated IP pool in just a few easy steps. EasySendy Pro implements industry best email marketing practices, standards and send emails through your selected cloud SMTP relay service provider gateway. EasySendy Pro Agency Plan solution is deployed on highly secure and trusted PCI compliant servers. 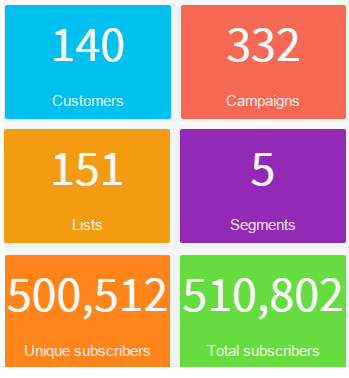 Easily access all information of your Email marketing services, at Whitelabel admin dashboard, lists, subscribers, segments, campaigns being sent and so on. Dashboard also shows the growth of email subscribers, lists, delivery bounce and recent activity of your email campaigns. Get help on any issue with email deliveries from EasySendy Pro Agency Plan Support Team. Yes EasySendy Pro Agency Plan Support Team is obsessive about customer happiness. Need more detail about EasySendy Pro Agency Plan Solution?